Need to Vent! — Movie Reviews with a Twist: HEAVENS ABOVE! "But man does not live by bread alone. For his material needs -- an infant variety. For his spiritual needs -- a variety of the infinite." There are all kinds of religions on God's Green Earth -- but in England, apparently, it is the Anglican Church that generally prevails. Likwise, there are all kinds of motion pictures, and in America, at least, it is the "feel good/happy ending" movie that has long been the most popular. Among the filmmakers who cater to this particular American cinematic style, none equal the incomparable Frank Capra, whose films include IT'S A WONDERFUL LIFE, MR. SMITH GOES TO WASHINGTON and MR. DEEDS GOES TO TOWN. Director Capra meet Directors John and Roy Boulting. What could easily have been called REV. 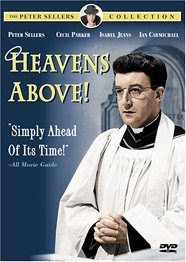 SMALLWOOD GOES TO ORBISTON PARVA or IT'S NOT A WONDERFUL LIFE, this 1963 film starring Peter Sellers is a biting satire on established religion, corporate greed, do-good mentality, and societal mores that insure the self-perceived elite control the not-so-noble downtrodden. Everyone on and off screen is skewered by these socially conscious twin brothers making the Boultings the "Rapiers of Ridicule." "And lying there on the deck of Lord Batley's yacht with the sun pouring down on my naked body, I suddenly realized how much easier it is for the rich to live that truly simple life our Lord advocated." Make no mistake, there is no hopeful message here. With one exception, until the arrival of Reverend John Smallwood (Sellers), the quaint village of Orbiston Parva is inhabited by uncaring, self-centered snobs who profess to be righteous and religious while their deeds can only be described as cruel, uncaring, greedy and self-absorbed. If this were Capra, the Not-So-Right Reverend Smallwood would make a difference through his living by the words of scripture and through his unwillingness to make compromises to the prevailing social fixation on class and wealth and status. I mentioned an exception to the population of Orbiston Parva, and what an exception this is. The Smith's are every uppercrust's nightmare. This dysfunctional family of Gypsies is huge in number, the parents are unmarried, the children are totally undisciplined and all, without exception, are coarse, crude, rude and conniving. In other words, your typical Canyon Lake lowlifes. This is a perfect set-up for a Capra film -- but in HEAVENS ABOVE! not only does government and the wealthy not give a damn but the poor are portrayed as lazy, manipulative and truly unworthy. In fact, Rev. Smallwood's single-minded pursuit of goodness and Godliness actually destroys the town when the best of intentions all backfire and even the outcasts fail to change or repent -- in fact, every kernel of standard Capra-corn gets the Hell popped out of it. For a "comedy" this is awfully damn dark. "Again? Oh dear...I sometimes wish the boy scout movement had never been thought of." Dark, maybe, but HEAVENS ABOVE! is awfully damn funny as well. Case in point -- the expression on the faces of a railcar full of clerics when the conductor announces that "the last supper" is being served in the dining car is absolutely hilarious. Another example is the product the Orbiston Parva (I just love the name of this fictitious town) factory churns out -- Tranquilax pills described as "The Three-In-One Restorative ... A Sedative, A Stimulant, A Laxative." That's a pretty powerful potion, but then again the Anglican Church has it's very own Three-In-One, "The Father, The Son and The Holy Ghost." Does Big Business trump the Big Guy Above in the Battle of the Trifecta? Of course it does, at least in this Gospel according to the Boultings. "Business Needs Profits Not Prophets." "Heavens to murgatroid! You gotta see HEAVENS ABOVE!" We at Needtovent concur wholeheartedly. HEAVENS ALONE! is available on DVD through Amazon.com. 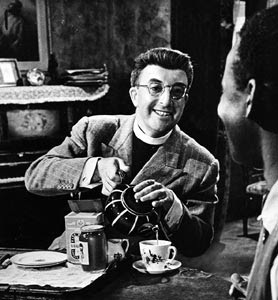 It is also one of six British comedies included in "The Peter Sellers Collection" DVD.